I love seeing the delight on our girls’ faces when they meet farm animals. They take such pleasure in giving cuddles to domesticated creatures which is something you can take for granted when you reach a certain age. However, last weekend I shared in a delicious piece of their excitement when I met this little fellow during a Devon day out at Pennywell Farm. Cute! 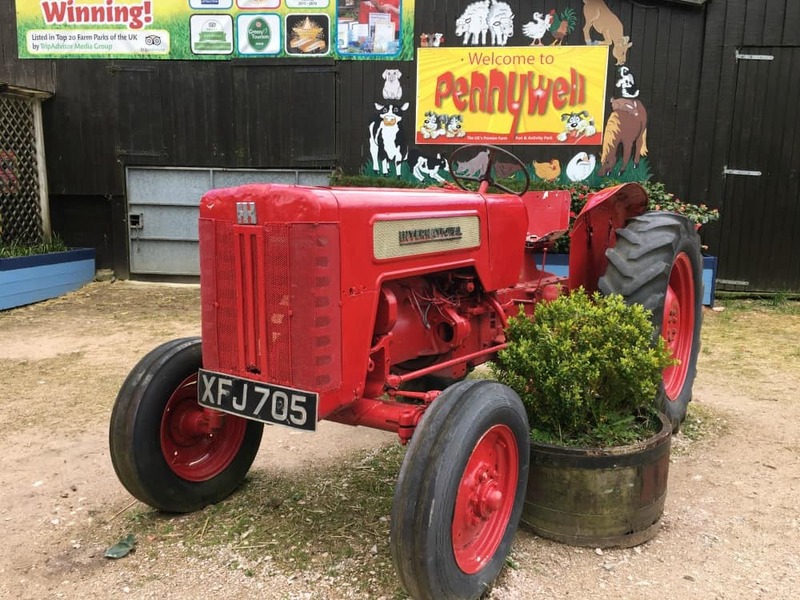 As the name suggests, Pennywell is a farm tourist attraction where you can meet creatures both large and small, from micro pigs to shire horses. Every half hour throughout the day here’s a hands-on activity in one of the barns or out in the fields. These range from milking the goats and feeding lambs to racing ferrets and the farm’s miniature pigs. There were a lot of people visiting on the same day as us so the best way to get a good view was to arrive for the activities early. Younger children need to be closely supervised to make sure they don’t get lost in the crowd when it comes to feeding the animals. Tin Box Tot and Baby had fun feeding one of the lambs and cheering on the ferrets who are racing for a saucer of goats milk. You can also put your name down to ride one of the farm’s donkeys throughout the day. This costs £3.50 for three circuits of the farm yard. The Tin Box girls were very excited to give this a go and looked incredibly cute in their riding hats. Their steeds, Fern and her baby, had the perfect temperament for their tiny riders. They were also adept at avoiding the children they found toddling into their path as they trotted around the yard. Elsewhere there were tractor rides through the fields, the Red Rocket trailer ride around the show field and a train ride. Pennywell also has an indoor play barn, a willow maze, assault course, dipping pond and a toddler-sized play farm. Then there’s a theatre where there are two shows on during the day. Our girls, aged four and nearly two-years-old, could both have a go on most things but there were a few age restrictions for the faster rides like the go karts (8+) and Red Rocket (4+). By far my favourite part of the day was cuddling and being cuddled by a rabbit sized miniature pig. This is such a popular activity that you can drop in any time during your visit for another squeeze. Be warned: it’s super addictive. Even Mr Tin Box melted a little! Pennywell Farm is a fun Devon day out for families with pre-school and primary aged children. While there are a few rides suitable for older children they might not be entertained all day. If you’re visiting Pennywell over the Easter holidays there are special events are happening during the Bank Holiday weekend. There’s an egg hunt and themed activities, as well as lots of opportunities to feed the lambs and kid goats. It sounds like it’s going to be egg-cellent! Sorry, I couldn’t resist! Find out more on their website. To see what else is on in Devon visit the Devon’s Top Attractions website. Disclosure: we were invited guests of Pennywell Farm and Devon’s Top Attractions and received free entry to the farm. All opinions are my own and those of my family.